I am branching out my baking skills and my wonderful husband requested that i bake him some choux buns so off i went into the kitchen to bake my little heart out. I wanted to share with you the recipe. 1. Preheat the oven to 200 degrees/400 F/gas mark 6. Grease and line 2 baking trays. 2. Put the butter and 250ml of water in a saucepan and heat until the butter melts. Bring to the boil and then remove off the hit. Quickly add the flour, return to the heat and beat the micture until it forms a ball of dough and leaves the side of the saucepan clean. Remove from the heat and then add the eggs, beating after each addition. Once all 4 eggs have been added and beaten in, the mixture should now be a smooth, soft paste. 3. Place 15 tablespoons of the mixture in balls on the baking tray, about 5cm in diameter. 4. Bake for 20-25 mins until the pastry is golden brown. Remove them from the over and make a small slit at each end of the buns with a knife to allow steam to escape. Place the trays back in the over for a further 5 mins. 5. Remove the buns from the over and spread the melted chocolate on the top of the buns and leave to set. Once the chocolate has set and you are ready to serve, spoon the cream into a piping bag and pipe the cream into the holes at the end of the bun. I am finding myself love baking more and more and i have so many recipes i want to try out!! Of course, ill be adding my favourites here once i have baked them. Yuuuuuummyyy! I love choux buns. 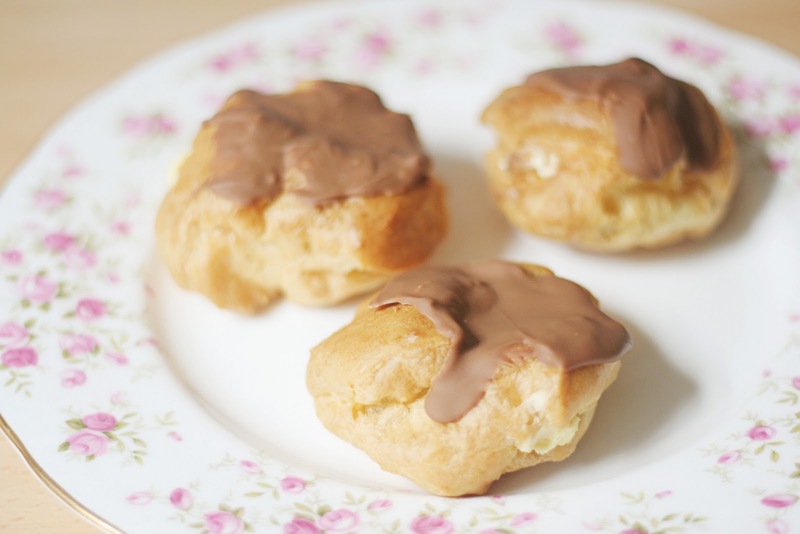 You can make little ones and fill them with custard & cream, then pour over chocolate sauce - Profiterole Dessert!! Only I would have to eat mine without the cream... 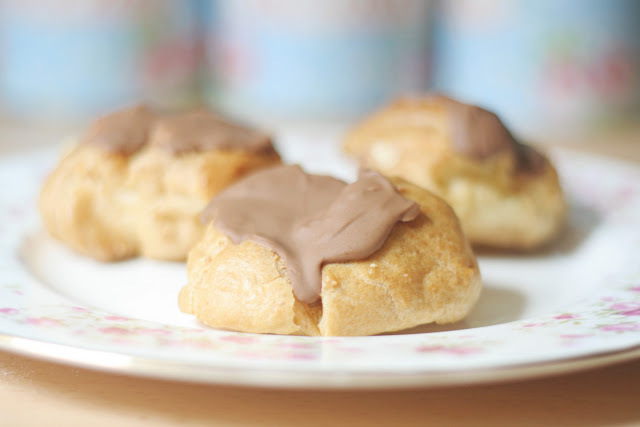 Still, soy custard is ok. And I love choccy choux buns, so I could cope!